The psychedelic garage rock sounds of Thunder Buffalo are courtesy of one man tour de force Aaron Schroeder. Not only did he write all the songs and play all the instruments himself, he recorded, produced and mixed the entire album as well. A true labor of love, Thunder Buffalo’s self-titled debut album is a fuzzy, swirling slice of unrestrained rumble rock with a danceable backbeat. While the distorted, monotone vocals can be indecipherable at times, they fall perfectly into place within the slinky, 60’s rock vibe and the loose, loungey feel that Aaron creates. Thunder Buffalo’s sound is like one of those garbled radio stations you find on a road trip that never quite comes in totally clear, but still manages to give you enough beat, melody and emotion to grab your attention and makes you a little sad when it’s gone. 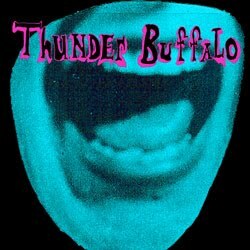 Whether it’s the pounding gallop of “Middle Of The Street” or the reverb heavy stroll of “This Is My Life,” Thunder Buffalo waits no time and no sounds in getting the point across. Forget long winded intros, indulgent solos, or vocal gymnastics, these songs are meant to start a party and make you move one way or the other. Song titles like “BeBop Sing-A-Long,” and the Wizard of Oz inspired “In The Valley Of The Scarecrow” let you know that there’s some uncharted musical territory just waiting for you to stumble upon. The 11 tracks on Thunder Buffalo clock in at just under 33 minutes, which is just enough time to hook you and then leave you wanting more. With Aaron's musical output frequency thus far, I'm sure there's more fuzzed out, static-laced ditties to look forward to in the near future. Since recording this album, Aaron has rounded up a few folks (Andrew Greagor on drums and Branden Kempt on bass) and taken Thunder Buffalo on the road. While I can’t imagine the live performances sound exactly like the record, I can’t imagine you’d stopped being mesmerized long enough to notice or care.